Harrogate Town captain Josh Falkingham lamented his team’s performance following their midweek defeat at Solihull Moors. Town have flourished since promotion to the National League, though much of their success has been achieved as a result of the expansive passing game that has become their trademark. That brand of football was nowhere to be seen against Solihull, however, much to the frustration of Falkingham. “The real disappointment for us is that we didn’t apply ourselves,” he added. “We didn’t do what we are good at enough, if at all. I don’t think we even got into second gear. Right from the start we were poor. We didn’t get the ball down and pass it and that played into Solihull’s hands. Next up for Town is a home meeting with Aldershot on Saturday, and Falkingham is expecting a reaction. “We need to bounce back and put things right,” he added. Elsewhere, In the National League, 16th-placed FC Halifax head to Dagenham and Redbridge. High-flying Farsley Celtic could move within three points of the Evo-Stik League Premier Division leaders with four games in hand if they can see off promotion rivals Basford United at Throstle Nest tomorrow. The Celts have put together a superb run of form recently, having gone two months unbeaten in all competitions. Adam Lakeland’s side are now just two wins behind table-toppers – who they beat 2-1 in the League Cup on Tuesday. 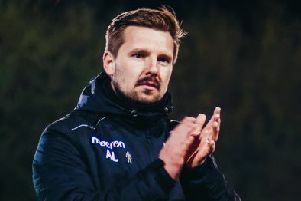 In the Evo-Stik East Division, promotion hopefuls Tadcaster Albion could swap places with second-placed Lincoln United if they get the better of the Ashby Avenue outfit in Lincolnshire tomorrow. Elsewhere, Brighouse Town travel to Sheffield FC, as they push for a promotion spot. Incredibly, three West Yorkshire sides – Tadcaster Albion, Brighouse Town and Pontefract Colleries – are all on 30 points after 17 games, with just one goal separating the sides on goal difference. Pontefract will look to leapfrog the pair by winning at mid-table Gresley and extend their four-match winning streak. At the foot of the league, Frickley Athletic hope to avoid a relegation battle as they host Loughborough Dynamo. The Northern Counties Football East League Premier Division sees runaway leaders Yorkshire Amateur take on Worksop Town at home, as they look to make it 12 wins from 13 games. Knaresborough Town could move above Sheffield-based Penistone into second spot if they get the better of an out-of-form Barton Town side, who have only won twice since the middle of October. Seventh-placed Hemsworth MW will look to regain some of the form they showed in November as they travel to take on Garforth Town. The Miners won three games in a row across November but have only taken one point from a possible six since. Elsewhere, Liversedge host Goole and Athersley entertain Harrogate Railway. In Division One, Selby Town play at home to Harworth Colliery, Nostell MW host Dronfield, whilst AFC Emley travel to Skegness and Glasshoughton Welfare host Worsbrough Bridge.